Several times I’ve thought about making a photo book. Since I’ve been in numerous countries across the world in the last fifteen years and assembled several terrabytes—well, many more than several—of saved images it seems like I would be a prime candidate to produce more than one photo book. But the moment never seemed to be right, and I couldn’t bring myself to do the research into the procedures and techniques of producing a good book. I’d see the ads for companies that made books and even had friends that showed me books that they had made, but I just couldn’t bring myself to do the research to get started. But Rocky Nook sent me a review copy of Petra Vogt’s Create Your Own Photo Book and the idea and ability to create a book was dropped into my lap. The thing about reading books to do a review is that you learn things. Education never stops and even at my age new ideas are welcomed. Petra Vogt is an author who spells out the steps in the most logical and linear manner. This is something that I appreciate as I am a linear thinker who prefers a step by step approach. One of the things that was evident very early on and which was more and more obvious as I read was the fact that Petra Vogt can effectively use (and has used) all of the programs and companies mentioned. The writing is not just making comparisons from spec sheets; major insights and comparisons appear on nearly every page. Imagining Vogt’s writing process as the book was written I envision some huge wall covered with 3″ x 5″ cards—each containing a tidbit of data about specific programs—and the author laborously fitting the cards into a mosaic of comparisons and procedures. However the book was written, the author has the abilty to make a complex set of choices fall into patterns through which the reader can work their way from step to step based on tons of available information. Companies that make books and the software to make them are discussed without bias so that the reader can easily decide what to do when, and have sufficient information to justify their decisions. Vogt begins by examining the purpose of the book, discusses many book producers and their requirements and restrictions; then examines layout and discusses why text should be written before you start to layout images. Then the author discusses why previewing, and checking for errors and saving and saving is necessary. With some producers your file disappears when you place your order. Oh, and don’t forget that there should be no spaces in file-names as most producers don’t accept them. With that for a start you have to realize that the producer determines the software you use, and that has to be in place before you begin. Some software is proprietary specific and some is producer independent. By selecting a company to print your book you have set up the software you most likely will use. From the professional standpoint, both Adobe Photoshop and InDesign can produce a photo book, but there are both downloadable and online softwares provided by specific companies that are free to the user. Just remember, you are always working on a double page spread no matter what software you are using. The Service Provider Options Overview that appears on pages 29-31 is worth the price of the book alone to me in that all the pertinent decisions of selecting a supplier can be compared for the major established book producers. Some suppliers simply do not produce books of certain sizes. Certain papers are available only from specific companies. Choices of Fonts? Check the list to see what a company allows or rejects. Got a specific cover type in mind? You had best check the tables to see if the producer you had in mind will provide it. The tables are invaluable. But reading onward, Vogt discusses the kinds of pictures that seem to work best in different types of books. Portfolios are different from travel collections, and the intent of the book determines the look and the use of white space and borders, and frames. Organizing images and keywording them with software makes the editing process easier when you are selecting images for a project, and the size of images is discussed. Some companies limit image sizes to 15 or 25 megapixels with the maximum pixel dimensions being 4,000 pixels. The companies are named and it’s a good thing as these items are not mentioned in the Service Provider Options Overview. Most book producers work in sRGB color space and require the designer to either work in that space or the company switches to that space when producing the book. As an artist who usually works in Adobe1998 color space that came as a surprise since sRGB is a less dynamic color space than Adobe1998. Oh, and saddle stitch binding limits your book to 100 pages; so keep your final look in mind before you start laying out your pages. Story boarding your book before you start layout is discussed and suggestions are made on the procedures, which range from sketches to laying out small prints of all the work you hope to include. Start with a big empty table and a stack of drugstore prints and begin the layout procedure; it will save you time and enhance your publication. Working on the gestalt of your combined images is much easier this way. Do you like to use guides when laying out your pages? InDesign and Scribus offer smart guides. Process your images prior to layout; do not depend on the layout software to have adjustment capabilities for your images. Borders, frames, transparency, image masks and corners all should happen in your image editing software, not on the layout page. Which company handles spell checking in their software? The answer is in the text, not in the Service Provider Options Overview. Quality control issues are discussed, and preview procedures and problem checklists are provided. That’s on page 168. Two pages of troubleshooting tips help keep you from going wrong. Finally, save a local copy of your work. I’ve already mentioned, some work disappears with some companies when you order—especially if you are working with online software. Some companies allow the production of a ebook readable on an iPad and for a small fee you can get both a physical book and an ebook for the same project. To end the book, a series of five real-world projects are examined step by step and the reader can follow the thinking process of the production of some actual books. As a testament to my own learning process, while reading I found myself with five pages of closely written notes and ten pages of copied tables and check lists for easy reference later. 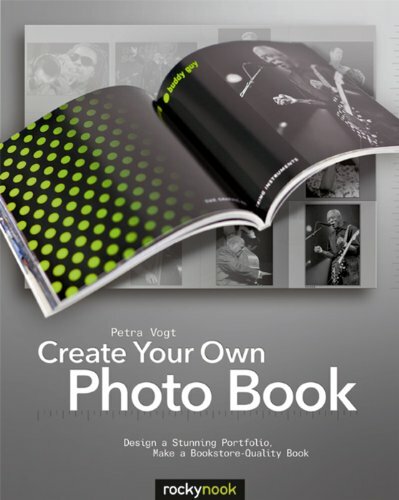 If you ever considered producing a picture book, I heartily recommend Petra Vogt’s Create Your Own Photo Book. I think I am finally going to delve into my stack of hard drives and see what I can produce.